I first discovered kale last winter, when I picked some up from the Silver Spring farmers market with great excitement after hearing foodie friends rave about it. I didn’t get it. I tried steaming it, sauteing it, putting it in soup, eventually settling on a mix of all three to make it palatable. 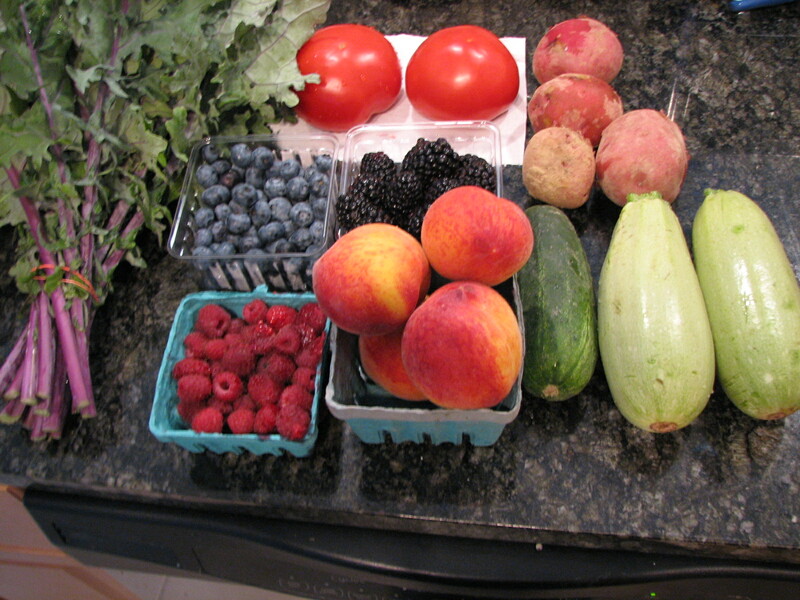 So when I saw that this week’s CSA offerings included kale, I approached it like a supervillain in my kitchen (As in: We meet again, leafy greens I know I’m supposed to like). 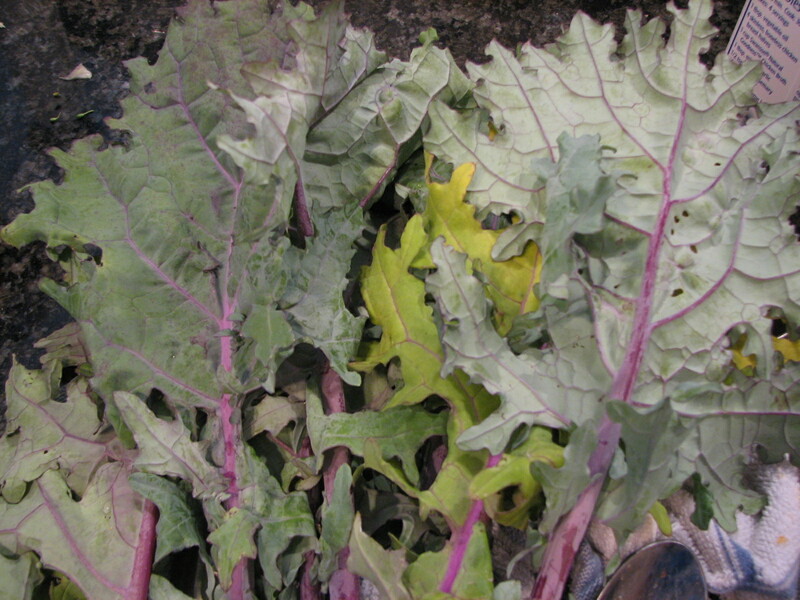 Kale, lurking in the upper left corner of my CSA offerings. Steaming it, then sauteing it, then putting it in soup all seemed like a bit much to make a food palatable, no matter how healthy it is, so I decided to try kale chips instead. 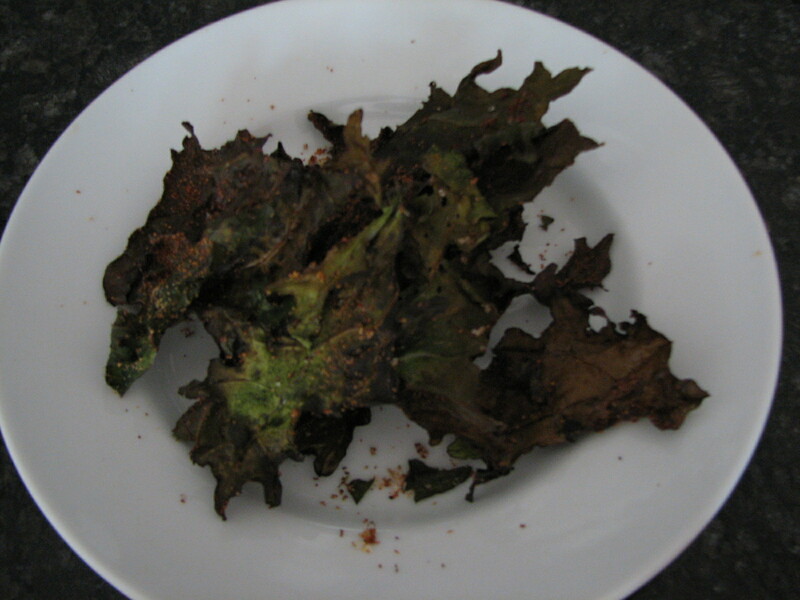 Wash the kale, and *dry thoroughly* to prevent soggy chips. Tear leaves into chip-sized pieces. 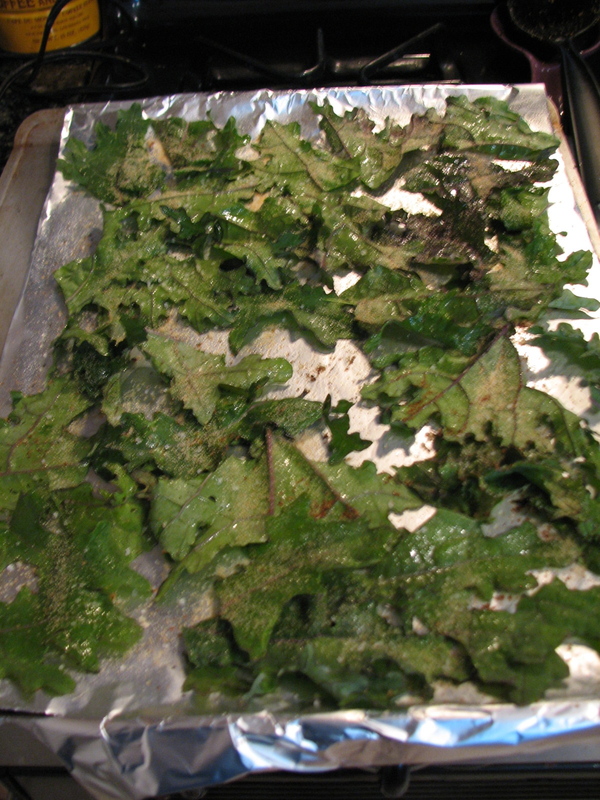 Coat each side of each leaf with cooking spray, garlic powder, pepper and more sea salt than could possibly be healthy, and arrange on a baking sheet without overlapping chips. Bake for 10 minutes at 350 degrees. Eat. All in one sitting (or maybe that’s just me … ). What’s your favorite use for kale? Any delicious, runner-friendly recipes you’ve discovered this week? I’ll have to try this – I keep hearing that I ‘must’ have kale too and just don’t get it. I’ve heard of people putting them in their smoothies too but it seems too bitter for that. Thanks for the idea! Soo…..they were Good? Maybe the Sea Salt was the key here, mine definitely lacked that ingredient. 😉 I will try them again, with the same Supervillian attitude. I refuse to be defeated by a leafy green! They WERE good! So good! I think sea salt is essential … I know this probably knocks the chips right off the dietitian-approved chart, but they sure were tasty! I will have to try this also, as I HATE kale. It lurks and I end up throwing it away because it gets soggy and gross. Anything to make it more edible, sounds good to me.